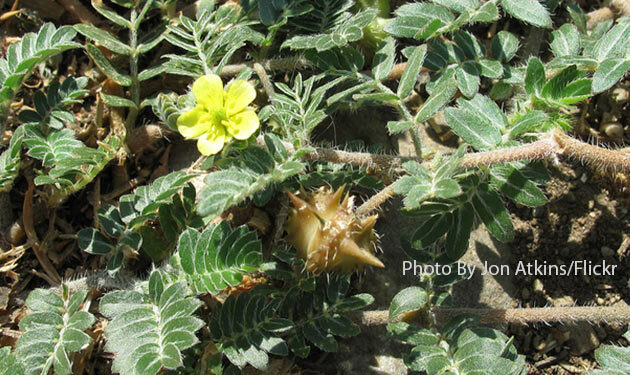 Puncture Vine or Goathead ( Tribulus Terrestris) is a tropical herb, grows to 1 m. tall, leaves are pinnate and oppositely arranged, stem branched, the flowers are lemon yellow in color, petals. The nuts are hard, bear 2 to 4 sharp spines, about 10 mm long and 6 mm wide, and resemble goat’s heads. To increase physical and sexual power, useful in the treatment of kidney, bladder, urinary tract disorders, Vata disorders, TB etc. Warning: Do not use it in the time of breastfeeding and pregnancy, it may cause very low blood sugar.